Looking for home decoration ideas for Diwali? Read the article below on Diwali decoration ideas to give your home a festive look. You can read about Home decoration ideas for Diwali, homemade craft for Diwali decoration, and homemade sweets for Diwali that would help you in your Diwali decorations and welcome your guests. Diwali is one of the most auspicious occasions in India. It is the time when we clean every corner of our home to give it a fresh and bright look with fancy decorations such as Diyas, candles, rangoli, flowers, Bandanwar or Door-Hangings, Idols of Lord Ganesha and Goddess Laxmi and lots more. Home decoration is very important and essential part of Diwali to welcome the Goddess Laxmi and Lord Ganesha who visits all homes to bless the people so to attract them and take their blessings people decorate their home in all possible ways. 1. Cleaning is an important part of Diwali decoration as Lakshmi, the goddess of prosperity brings her blessings to houses that are clean and comfortable. So clean every corner of your home and make it completely clutter free. Clean your old and dusty furniture, remove spider webs from every corner of your home, clean the ceilings, electrical fittings such as air conditioners, wall lights, ceiling fans, floors etc. to get a complete clean look. 2. Apply a fresh coat of paint on your walls but if you do not have time to paint than just cover them with beautiful wall hangings, colorful fabrics and ribbons. Use your old clothes such as Saris, Dupattas to make a trendy curtain. 3. Try new Home furnishing items such as bed sheets, new pillows, furniture coverings, floor carpets and curtains around the home to bring a new life in your home. Do not have budget to buy new than just wash your old ones in little warm water with some good detergent powered and iron them properly to get new shine in them. 4. To decorate the main entrances of your home hang Torans, Bandhanwars or Door Hangings at the main entrance and the door of the worship room. You can hang little bells, artificial flowers, or handmade Bandanwars made up of craft papers and other decorative items on your doors to welcome your guests. 5. Decorate the entrance of your home with beautiful Rangoli made up of rice flour paste, colored chalk, flower petal and crushed limestone's to enhance the beauty of your home on Diwali. You can also purchase the Rangoli colors from the market. You can make the symbols of Swastikaa, lighted Deepak, Kalash, Peacock, flower patterns, small footprints coming into the home, Kalash and lots more according to your creativity skill and ingredients you have in such Rangolis. 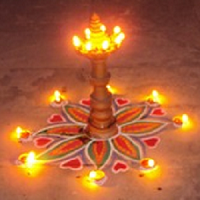 To add more beauty in your Rangolis place diyas and candles at certain positions. 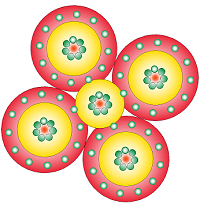 You can also buy Rangoli stickers from the market and paste them in case you do not have to time to make Rangoli. 6. Diwali is the festival of lights so decorate your home interior or exterior with lots of light. Try to use lots of earthen lamps (diyas) and candles instead of electronic lights to add more beauty in your Diwali decorations. You can buy these diyas and candles from local vendors and paint them yourself to add your personal touch. Place them in different spots in your house especially in the dark corners of the house even in bathroom. Use aromatic candles and floating diyas available in different shapes in market in your Diwali decorations. 7. Decorate the puja room or place with idols of Lord Ganesha and Goddess Laxmi. Use Fresh flowers such as Marigold, rose, orchids in Puja room decoration. After making all above arrangements your home is ready to celebrate the Diwali and welcome the Lord Ganesha and Goddess Laxmi and your guests also. What is the right process to perform Lakshmi Pooja on Diwali? Looking for Diwali pooja process at home? Here we are with step by step information on Diwali puja at home. Here you will find the list of Important Items needed for Lakshmi Puja, Lakshmi Puja Process, mantras related to Lakshmi Puja and so on.